Developer Redlynx has released another game in their long developed Trials series. Does it live up to the franchise, or should you leave this one alone. We have to go back all the way to the year 2000 to find the first release of a Trials title, and it was a 2.5D, browser only game. Through the last 19 years the game has moved from browsers, to mobile, to PCs, and finally on to include consoles. Through it all the same basic premise has survived, albeit with a physics model that has varied from being close to reality, and has ventured all the way to totally insane. Race the clock, and traverse harder and harder environments and tracks, all while trying not to crash and burn. 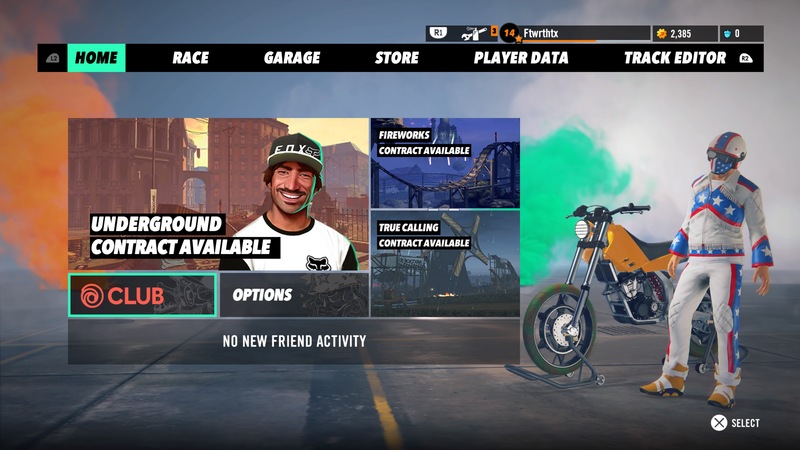 Trials Rising starts you out easy enough, with a basic motorcycle that is efficient and easy to handle, on a simple track with a simple goal. Make it to the end as fast as you can, with as few faults as possible. You’ll earn gold and experience points along the way, and slowly rank up higher and higher. The higher level you achieve, the more tracks you’ll unlock, and the harder the difficulty becomes. It’s a pretty standard Trials formula, and it works well, even though you’ll have to work to get up to the higher levels. There are tutorials at the University of Trials to teach you the ins and outs of controlling your bike, but these aren’t all available in the beginning. You’ll have to rank up to unlock more and more of them and they become exponentially harder to complete with a passing score. The gameplay is more of a trial and error type of mechanic. When you crash, and you will many many times, you can choose to either take a fault and just move back to the last checkpoint, or take no fault and start the level completely over. Taking a fault also increases your overall time, so if you are looking to climb the leaderboards or trim some time off of your record, starting over is generally the better way to go. 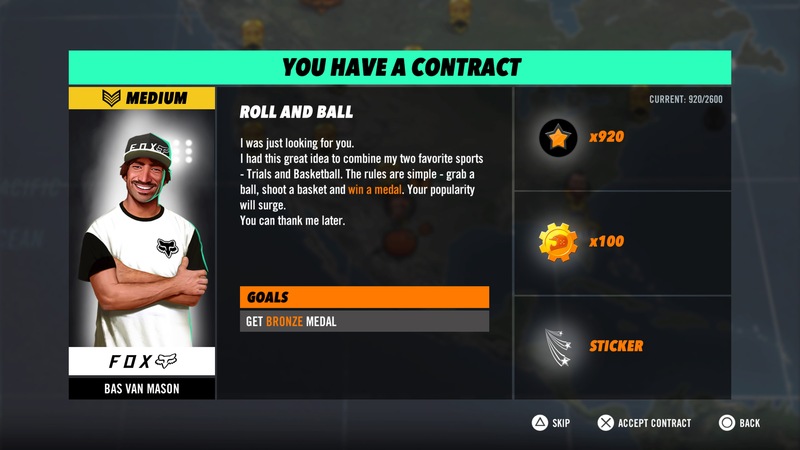 As you progress through the levels, you’ll eventually unlock sponsors that will have contracts for you to complete. These can range from beating a specific opponent to completing special tasks like 5 back flips. They vary from race to race, but are an excellent way to rank up and earn more gold. Each race will have ghosts of your opponents and these can actually help you finish with a faster time, if you are paying attention. Some tracks have a faster line and watching someone’s ghost just might reveal where it is. One thing you’ll learn early on is that unless you need airtime for tricks, it’s never a friend to the clock. Keeping your back tire on the ground is paramount to faster times, and watching the ghosts of the fastest riders will show that. Flying through the air and doing a triple back flip might look cool, but if the contract says finish first, those back flips are pointless and are only slowing you down. Keep that back wheel on the track so you are accelerating as much as possible, and maybe even tap that brake as you are going over a jump. You’d be surprised how much time that can save. As you progress up the ranks, you’ll unlock more and more regions for racing, which unlocks more and more tracks for you to crash on. 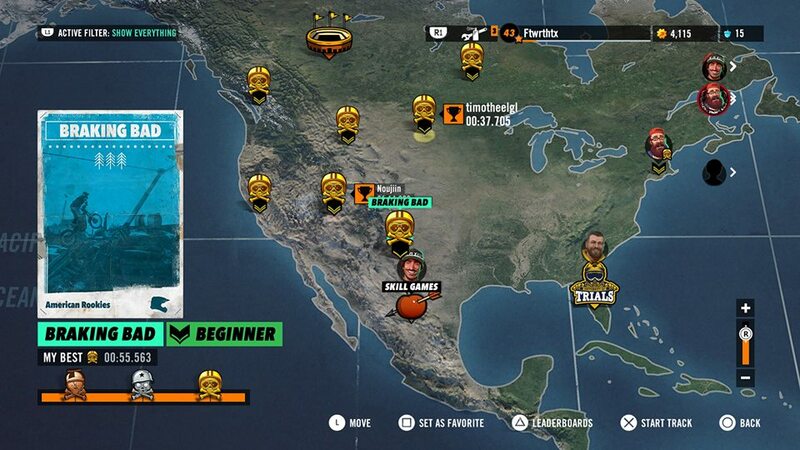 These tracks get harder and harder, and you’ll find yourself struggling at times to get that Gold or Platinum rating. You can also use the track builder to create your own tracks or head over to Track Central to download tracks others have created. You’ll have an endless supply of tracks to create and play, which gives the game an insane amount of replayability. 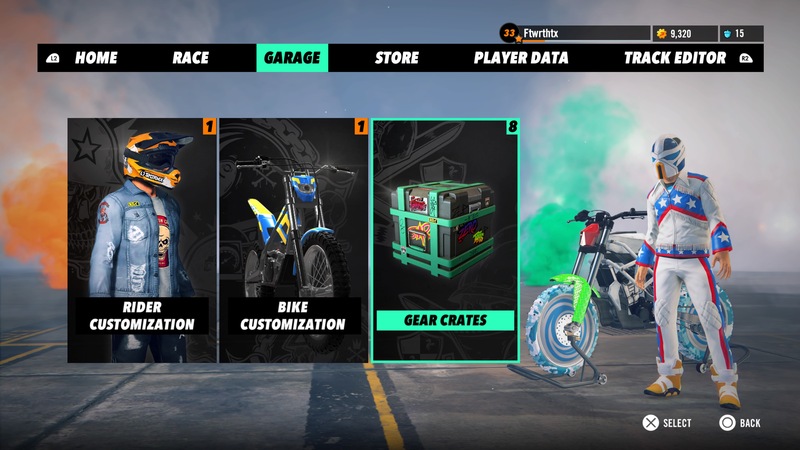 As you rank up you also unlock crates which give you customizable accessories for your bike, your character, and your tracks. These crates can hold clothes, stickers, and/or bike parts. You can customize your bike to make it your own, complete with letters or designs, and then you can share that design with the world. If others like it, and decide to purchase it, you’ll get a cut of the gold they spend, up to a certain specified amount. The game looks pretty impressive in 4K, for those of you with that option, and runs incredibly well at 60FPS. We played on the PS4 Pro on a 55″ 4K TV and other than an occasional stutter when there was a lot going on, the game ran pretty smooth. The stutters generally happened if there were huge explosions blowing us to hell and had zero effect on the outcome of that particular race. Level design and the level of detail are exceptional and adds to the overall experience nicely. The soundtrack for the game is very hip and fresh, with a nice mix of fast paced genres of music. It would have been nice to maybe turn some of them off, but none were so bad we couldn’t stand them. The multiplayer aspect of the game is pretty straightforward. Online racing is fast and fun, but there’s a local co-op mode that puts you and a friend on a tandem bike that requires you both to work together. The throttle can get up to 120% of normal if you both accelerate at the same time, but one person can only hit 60% by themselves. It requires team work in every aspect of the game play, as your partners leaning, if opposite yours, can cancel out all off the leaning. Flips require you both to lean in the same direction, and stability is impossible if you aren’t working together. Sounds complicated, but it is a load of fun. 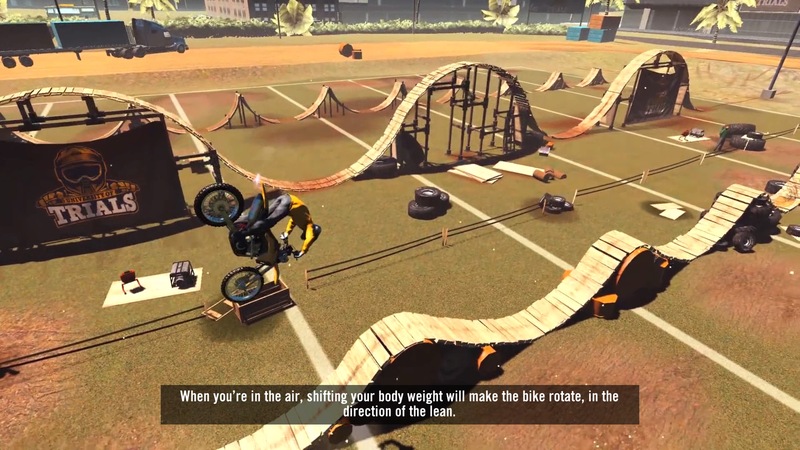 Trials Rising isn’t trying to reinvent the wheel here, and sticks to the tried and true formula of arcade physics and fun tracks to test your ability to adapt, overcome, and improvise your way through an endless supply of content, both from the developers and from other riders like you. Priced at only US$24.99 (US$39.99 if you want the Gold Edition that includes the season pass), the game is an incredible amount of fun! Trials Rising review code provided by publisher. For more information on scoring, please read: What our review scores really mean.